Property 10: Stone Cottage On Edge Of Suisse Normandie, In Lovely Countryside. Property 23: In the countryside Normandy charming house of Architect in wood. Property 30: River Cottage, sleeps six. 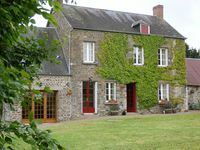 Property 40: Wonderful gîte in the Suisse Normande with lovely garden and gorgeous view.